The first thing you need to think about when planning your Thanksgiving restaurant menu is what your theme will be. This means choosing whether you want to go with a traditional Thanksgiving dinner of turkey and stuffing using the classic flavors, or play around with variations. Either option can be successful if done properly, but it is important to let your customers know what you will be serving. Some people go to restaurants for the holiday specifically because they want the traditional meal without the stress of making it, while others go so they can get a change of pace and try new foods that are loosely based on the classics. Before getting too far with your Thanksgiving restaurant menu, it is also important to keep in mind how much food your restaurant will be producing. While certain classics are okay for a simple family dinner, they aren’t the best idea if you are planning on feeding 50 to 100 (or more) customers. If you want to stick to the traditional foods, try to come up with better or more efficient ways of cooking them. It is the large quantities, however, that make some new twists on classic Thanksgiving foods very tempting as they are easier to prepare and taste just as great. When most people make turkey for their family, they make it whole, but if you are making Thanksgiving dinner for lots of diners in your restaurant, this is not the best idea. 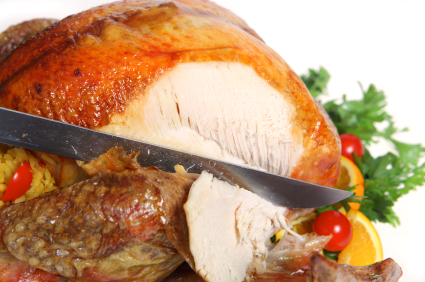 You can still have the same flavors, but experts recommend that you cut up the turkey; otherwise the various parts won’t cook evenly. Some chefs roast everything then take off the thighs and legs once the breasts are done. Others separate the turkey at the beginning to ensure that it Is cooked to perfection. Remember that if customers come to you for their classic turkey dinner, they expect a perfectly moist and delicious bird. If you want some variation and additional flavor for your restaurant’s Thanksgiving menu, then try following the example of a restaurant in New Orleans. Instead of the traditional flavorings, they brush their turkey with garlic and then dust on some Cajun seasoning to give a little bit of heat to the dish. They even add on oyster sauce. The success of this dish is proof that even non-traditional flavors can be popular when combined with the traditional. Therefore if your restaurant specializes in a certain type of cuisine, such as Italian or Greek, you should consider adding some of those flavors to the Thanksgiving dinner you serve. If your restaurant is upscale, that doesn’t mean that you are out of luck when it comes to serving Thanksgiving dinner. All it means is that instead of serving the dinner family style, you will probably want to have servings divided into courses and individually plated. Then your creativity and culinary training will come into play as the traditional roasted turkey with stuffing may not be acceptable. Instead, try serving apricot glazed turkey with fresh herb gravy and cranberry flavoring to give your customers the feeling of the traditional flavors of the holiday, but with a high class twist. It is important to remember that just because your restaurant will be serving food on Thanksgiving, that doesn’t mean that it has to be closely related to tradition. Some restaurants won’t even include turkey. Some places in Maine, for example, will swap out the stuffed turkey for a stuffed lobster. When planning your menu, it is important to appeal to your customers; if you know they enjoy a certain type of meat, try considering it as an option alongside the turkey.